A year ago I didn't care for this cigar. Now, damn this is a great smoke. It's even a bit cheaper then CAO Brazilia which I like. And I must say even better/more complex. I've yet to meet someone that hasn't been impressed with the V.
I used to like the Brazilia...until I smoked a Camacho Triple Maduro. The 3M is my "comfort cigar". 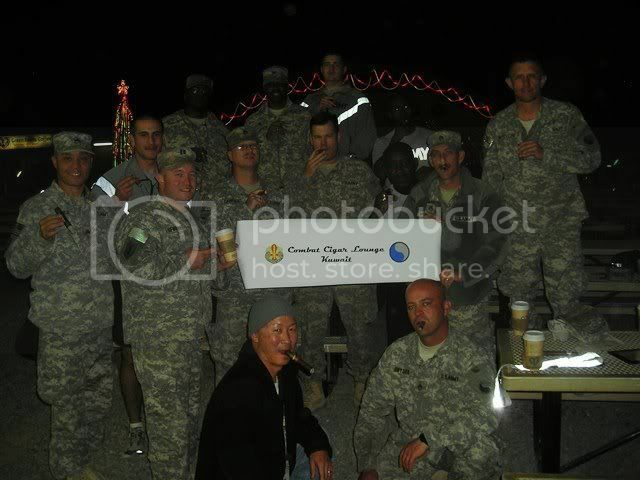 Steve2010- Are you a serving soldier in Kuwait? Retired, 24 years active duty as an M1A1/M1A2 Tanker. Now training Soldiers in Kuwait as a contractor. awesome, love the v's, had a 2010 maddy the other day with almost a year rest and was great, got a few 2011's left and ran into a hill of a deal on 5 this week to add, probably wait till december to have another, btw steve if you guys get low on cigars im sure ccom brothers can give you all the hook up and thank you and thank them for their service from us! Thanks. A few CCOM BoTL are getting something together for me to give to the Soldiers. My fav cigar. Size too. Funny thing, I didn't like it either when I first smoked it. I did like the 08 maduro though. Then after 6 months or so I fired another up and I liked it. In fact I've had several boxes since then and love them. The robusto and the 60 are my favs. BTW CAO Brazilia is another of my favorite though the Oliva V has a much better QC ratio. Seems I get a lot of the Brazilia's with draw issues. i like the V, but i feel that it is not a knock your socks off cigar. it is flavorful and never has issues, but ive never been "wowed" by it. id be very happy to smoke one but it is not in my normal rotation. they do age well though. I'm a bit confused on this vitola-is it not avaialble on ccom? They only show a Double Robusto 5X54 in the Habano and a 6X50 Toro in the maduro. I am putting an order together, including the Serie V, and was just going to order the double robusto. Anyone have thoughts on this vitola? The maduro is only made in one size and it varies anually. This year it's a toro. I had one a couple days ago - very nice. Pair it up with a really good nut brown ale. You should give Andy or Tim a call on that, they may be able to hook u up on that! Always call or email works too. The best Nut Brown Ales, IMO, are the Samuel Smith (British), followed by Fullers (also British), followed by Sam Adams. Any of those bad boys will surely do.